Back for Volume 2! Check out Volume 1 right here. It's tutorial time! 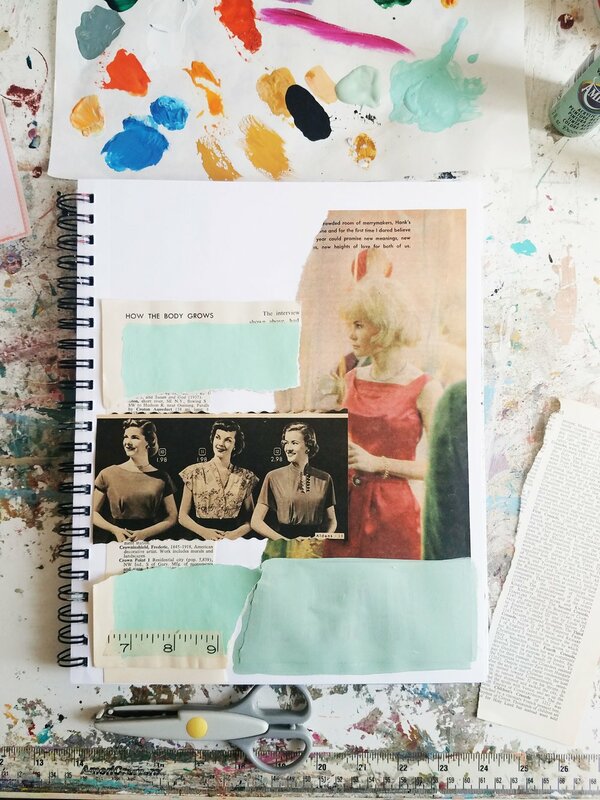 I am sharing how I use my collage materials to give you inspiration if you are interested in one of my collage paper packs. Reminder that these can be used for whatever you want! 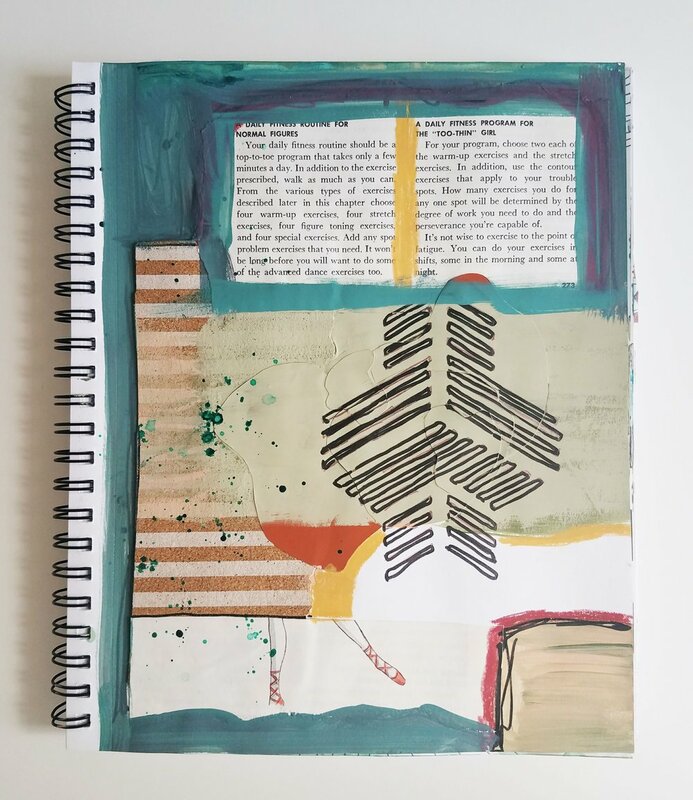 Collage, art journaling, zine making, etc. Fun supplies that can also be used- Scissors that cut patterns, paper punches, paint, watercolor, color pencils, pastels, buttons, ribbon, gel mediums, washi tape, whatever you have around! I made myself a pack similar to what I have in my shop. I laid out the paper to see what I was working with and what ideas start to come to me. I like to use a mix of new and old papers from thrifted books,magazines, and pamphlets that I have collected over the years. Very first layer is planned out and glued down right away (you can also design the entire layout first before gluing anything). I often like to glue the first layer down and then work off of that shape/color/theme. I decided to add some doodles for a final layer. Nothing too complicated and this was done on my lunch hour! You can make this as simple or involved as you like. Above: Examples of some collages I made in my sketchbook this year. I hope you are inspired to create! Check out my Etsy for my collage paper packs! I’ve been dreaming for a while now about getting out of the city and away from the distractions of everyday life to go make art. The reality is I can’t afford a solo cabin somewhere in the midwest (ideal spot for this daydream), so I decided to make a DIY at home art retreat for myself the Sunday before labor day. It started when a few days prior I was looking at my calendar and noticed that I had no plans. I blocked the day out for art making and an at home retreat. Full disclosure that I more or less did everything I’m going to talk about here, but I did let myself get distracted with an impromptu invitation and went out with a friend to a comedy show. So...it wasn’t a full day but I did have about 5 hours to myself (I also had a sick boyfriend to go get medicine for). Limit distractions (dishes, laundry, etc). If you are thinking about doing an at home retreat, nothing fancy is needed for supplies, whatever you have on hand and normally work with are just fine. If you want to play around with a new project make sure you already have all the supplies ready to go so you’re not running to the store day of. Enjoy your day and think of all those times you thought “I wish I had time to work on that” and take this time to do the work! For me, it was really nice to start the day phone less and with a book. I haven’t done that in a looong time. It did set a good mood for the day and I got a lot done. Next time I do this I will make sure not to get tempted by an invite to go out so I have a full day retreat. Have you ever done a DIY at home retreat? How did it go? I would love to hear in the comments!